Although you might think of all dietary fats as unhealthy, consuming certain types called omega-3 and omega-6 fatty acids might help lower your risk for some chronic diseases. Oil extracted from seeds of the flax plant (Linum usitatissimum) is rich in these types of fats and has been recommended by practitioners of traditional medicine for centuries. Modern research suggests that supplements containing flaxseed oil could significantly benefit your health and well-being. Omega-3 and omega-6 fatty acids are called essential fats because you need to obtain them from food. One of the omega-3 fatty acids in flaxseed oil, called alpha-linolenic acid, or ALA, might be especially helpful in reducing the risk of high cholesterol and heart disease, according to experts at the University of Maryland Medical Center, who report that ALA may lessen the likelihood of blood clots, lower blood pressure and reduce the risk of potentially dangerous heart arrhythmias. Research supporting these possible benefits includes a study published in the October 2007 issue of the "European Journal of Clinical Nutrition" that found that ALA from flaxseed oil lowered blood pressure significantly in male subjects with high cholesterol, compared to a control group of similar subjects. Taking flaxseed oil pills might also help lower your risk of some types of cancer, according to research summarized by the Memorial Sloan-Kettering Cancer Center. Several laboratory research studies suggest that ALA in flaxseed oil might prevent growth of cancerous cells. For example, a study published in 2005 in "Nutrition and Cancer" found that laboratory animals exposed to a carcinogenic chemical who were fed flaxseed oil were 50 percent less likely to develop colon cancer and, when they did, had significantly fewer tumors than another group fed corn oil. Another study published in the October 2010 issue of "Molecular Nutrition and Food Research" found that flaxseed oil suppressed growth of breast cancer in laboratory animals. Although promising, these results are preliminary and still need confirmation in studies with human subjects. Components of flaxseed oil may also help suppress inflammation associated with some chronic disorders, according to several research studies that examined properties of the oil in laboratory settings. These include a study published in the February 2013 issue of "ISRN Inflammation" in which researchers found that the oil blocks several steps in the inflammatory process. Several clinical studies suggest that the oil might also help reduce inflammation in human subjects. For example, in a study published in 2007 in "Arquivos Brasileiros de Oftalmologia," researchers found that subjects with an autoimmune disease called Sjogren's syndrome who took flaxseed oil had less inflammatory eye problems than a control group, while another study in the December 2012 issue of "Nutrition Research" found that subjects with kidney disease who took the oil had lower blood levels of an inflammatory compound called C-reactive protein than controls. Flaxseed oil is available from health food stores, usually in softgel pills. Choose supplements certified free of contaminants, such as heavy metals, and store them under refrigeration and protected from light and extreme heat. 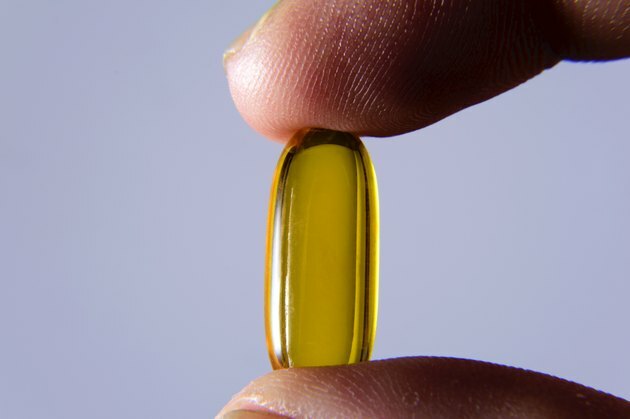 Although generally considered safe, flaxseed oil pills might cause an allergic reaction in some people and could slow the uptake of some medications or nutrients. They may also interact with some drugs, including blood-thinners, diabetes medicines and drugs that lower cholesterol. Talk to your doctor before adding flaxseed oil to your regimen, to determine if it might be helpful for you. What Are the Benefits of Alfalfa Powder?